The period between 1630 and 1660 was one of the most tumultuous in Western history. These three decades witnessed the birth of English America and, in the mother country, a vicious civil war that rent the very fabric of English social, political, and religious life. It was an era of death and new beginnings, and at its heart was one remarkable family: the Rainborowes. 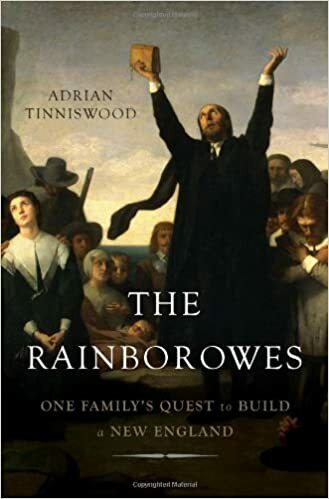 In The Rainborowes, acclaimed historian Adrian Tinniswood tells the story of this all-but-forgotten clan for the very first time, showing how the family bridged two worlds as they struggled to build a godly community for themselves and their kin. The Rainborowes’ patriarch, William, was a shipmaster and merchant whose taste for adventure and profit drew him into the expanding transatlantic traffic between England and its colonies in the New World. Eventually two of his daughters settled in the Massachusetts Bay Colony, marrying into the upper echelons of New England society. Back in England, meanwhile, William Rainborowe’s sons threw themselves behind the English parliament in its rebellion against King Charles I. So, too, did many New World settlers, who returned to England to fight for the parliamentary cause. When the monarchy was restored in 1660, many of these revolutionaries quit their homeland for New England, where their dreams of liberty and equality were much closer to being realized. Following the Rainborowes from hectic London shipyards to remote Aegean islands, from the muddy streets of Boston to the battles of the English Civil War, Tinniswood reveals the indelible marks they left on America and England—and the profound and irrevocable changes these thirty years had on the family and their fellow Englishmen in Europe and America. A feat of historical reporting, The Rainborowes spans oceans and generations to show how the American identity was forged in the crucible of England’s bloody civil war.